Growing up, we find our heroes in sports stars. There was only one sport that was dear to me as I was growing up. The sport was soccer or as we call it these days, football. I’m the first to admit that my efforts on the field were mediocre at best. I was nowhere near as good as my name would allow people to believe. That’s not the point of this though. The point is that for a child who lives and breathes soccer, the next best thing to the ball itself are the stars who we admire and aspire to play like. When I was a child there were two players that I idolised. Argentina’s Diego Maradona and Brazil’s Romario. Back in 1994, the USA hosted the World Cup. Snickers and McDonalds were major sponsors (the marketing lasted the test of time). Maradona played for Argentina and after a convincing win against Greece, he was tested for drugs and the results came up positive. I didn’t know what the implications of drugs were at the time, the only sense I made of it was that it’s cheating. 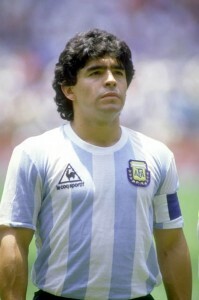 Years later, with more access to information (the internet) I was able to learn about this Maradona. I even read his auto biography in 2003. Despite all his errors and bad decisions, I don’t think I’ve ever been as impressed by a footballer as I am by Maradona. He is much more than a football player, he is a legend – for various reasons.